Early Meiji map of Japan suggesting the beginnings of European influence on Japanese cartography. 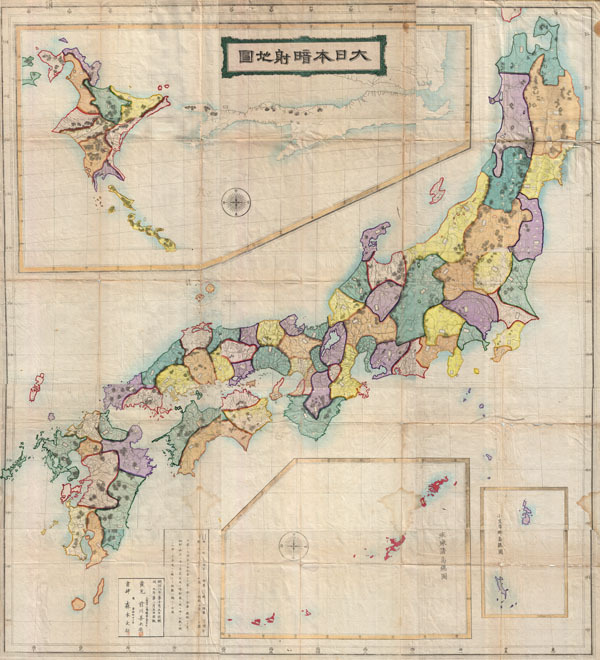 This is a monumental Japanese map of Japan prepared in 1875 or Meiji 8. Covers the entirety of Japan inclusive of Hokkaido and the Ryukyu Islands. Cartographically this map, like most 18th century maps of Japan, harkens to the Ino Tadataka surveys of the 18th century, though this example does exhibit considerable revision. Even so, the influence of the Meiji Ishin or Meiji Restoration is evident in the form of the prefecture structure adopted in 1871. Stylistically, this map strays significantly from Edo period cartography prepared under the Tokugawa Shogunate, and, though issued early in the Meiji period, exhibits considerable western, particularly British, cartographic influence. One curious aspect of this map is that it appears unfinished. Various empty cartouches appear throughout the map but are empty and no specific area is textually identified. This unusual omission may stem from a politic decision to discontinue the map in anticipation of further revisions, or simply suggest that the completion of the map was interrupted for other, unknowable, reasons. Good. Wear, slight discoloration, and very minor splitting on a few of the original fold lines. Older reinforcement to cover. Minor worm holing throughout - see image.